Let the bluebird of happiness lead you over the rainbow when the annual Spring Weekend comes to the pretty little village of Bot River on 1-3 September and a kaleidoscope of exciting wine, food and genuine, country-style fun explodes. 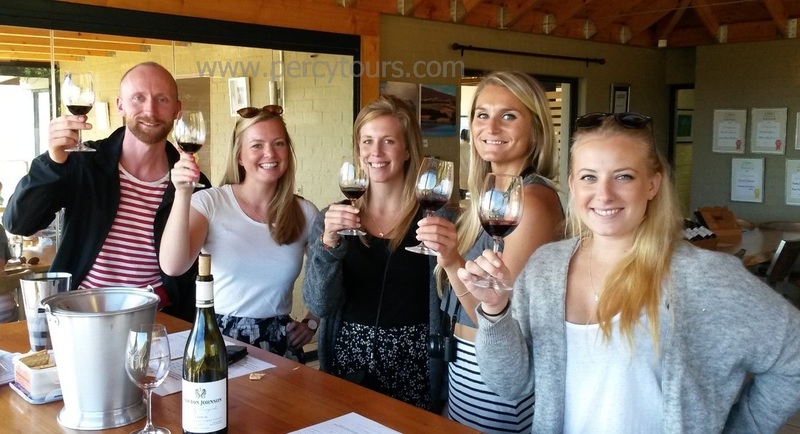 “The wineries of Bot River are truly a weloming community and the Spring Weekend is one of our favourite occasions to showcase our farms and the riches to be found on them,” says Melissa Nelsen of Genevieve MCC. The tone for the jam-packed weekend programme will be set at the Best of Bot Wines exclusive dinner on Friday, 1 September. The event stars Forage restaurant executive chef Gregory Henderson, renowned for roaming local pastures in search of ingredients for his indigenous dining experiences; Higgo Jacobs, head of the SA Association of Sommeliers, and fellow sommelier Ewan Mackenzie. Together they will present an expert food and wine pairing showcase, which offers the perfect context leading into the weekend. 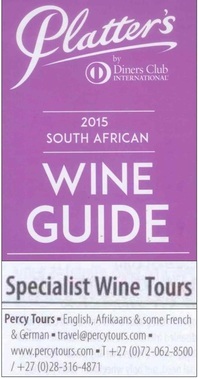 It takes place at Wildekrans Wine Estate. 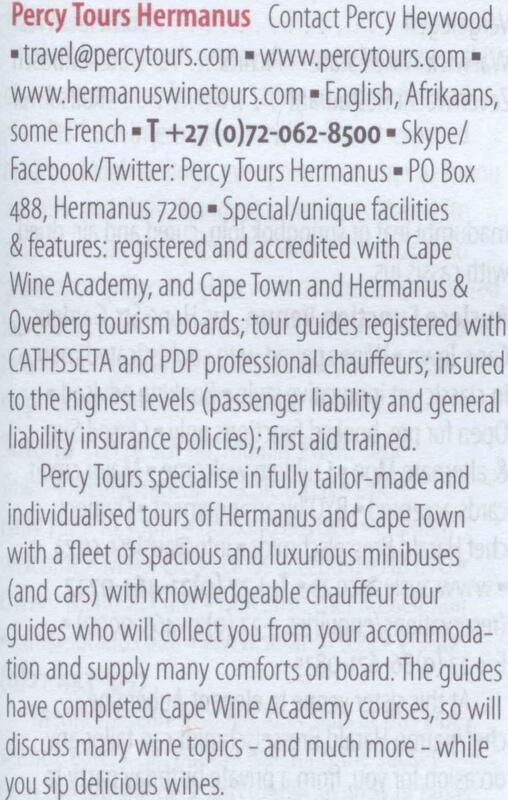 Tickets are R850pp, must be purchased through Quicket (details below), and include a Spring Weekend pass. 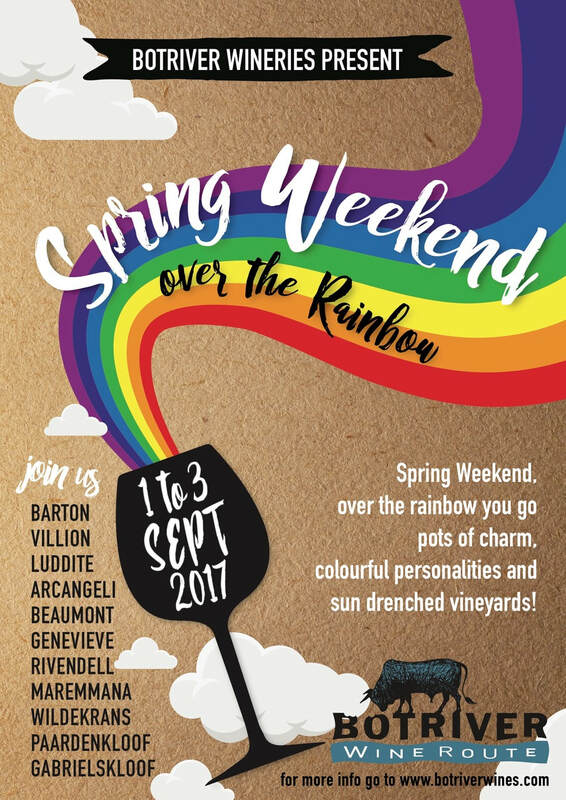 Then, on Saturday and Sunday, Bot River’s participating wineries will turn on the charm, each representing a colour of the rainbow. 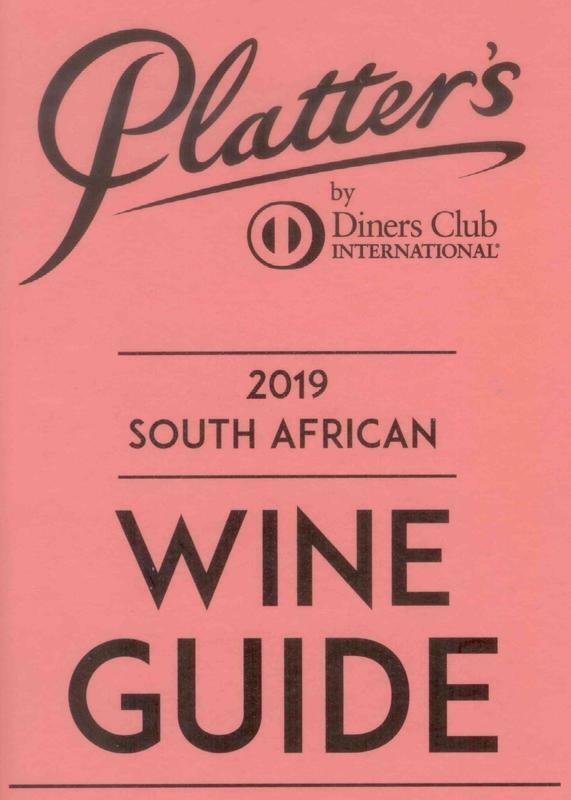 They include newcomer to the Bot River wine family, Arcangeli Family Vineyards; Barton Vineyards; Villion Wines; Luddite Wines; Genevieve MCC; Beaumont Family Wines; Gabrielskloof Wine Estate; Rivendell Estate & Vineyards; Paardenkloof Estate; and, Maremmana Estate. Why be a shrinking violet if you can unleash your inner Italian at the new Arcangeli Wines where a BARolo wine bar with an Italian-South African twist is on offer? Violet is of course, Arcangeli’s part in this rainbow theme as it presents a rare food and wine experience. It’s orange for the vines at Barton Wines, which dishes up a smorgasbord of fun from burgers to paintball, wine blending to tractor rides. Enter the wine blending competition and stand a chance to win a two-night stay in one of the Barton Villas. Wildekrans goes pretty in pink for the whole weekend, serving up its MCC Brut Rosé as you enter its gates. Enjoy a light meal at the wine tasting room or something more formal at Forage; bring the kids for tractor rides and the jungle gym too. Villion Family Wines waves a big red flag for spring this year, hailing the season as nature’s way of declaring: let’s party! Book your table and don’t forget your comfortable shoes for the Spit & Skoffel dinner dance on 2 September from 19:30. There will be Overberg lamb on the spit, complimentary wines per table and a wine bar too. The event takes place at the Afdaksrivier Nursery and tickets for the three-course dinner, wines and dance are only R385pp. Villion’s wines can be tasted throughout the weekend at the nursery too, where there’s a large garden, sandpit and jumping castle for children and a coffee shop. Silver is the colour for Luddite – a colour fitting of sterling wines and sublime experience awaiting visitors to the farm during the festival. In addition to latest vintage releases on offer, including the alluring Saboteur White 2017, there will be the extraordinary food truck run by Jason from the eponymous Cape Town bakery. Beaumont Family Wines lays claim to blue. Think little flowers and azure skies – and how you’ll feel if you fail to book for the special vertical tasting of the Hope Marguerite, a benchmark South African Chenin blanc. Have kids? Don’t worry: there’s a child minder on duty for the whole weekend, catered lunch and daily activities. Genevieve MCC will be decked out in a celebratory turquoise to present breakfast with bubbles at its new home – Klein Botrivier Farm on the Karwyderskraal Road. Grub’s up at 09:00 to 11:30, Saturday and Sunday. Tickets are R200; booking is essential and should be made through Quicket or at melissa@genevievemcc.co.za. You can also pop in for a tasting; learn to sabrage a bottle like a cavalry rider; and, linger longer with cheese and charcuterie platters. Mellow yellow is the colour of Gabriëlskloof Estate, a stunning, family-friendly destination surrounded by wheat and canola fields for most of the year. The restaurant menu will be inspired by spices and heritage cooking with mielies, curried fish, bobotie and the like. For something lighter, try the tasting room’s new Mzansi Tapas Taster platters at R250/couple which comes with 4 estate wines to taste. Kids under 12 eat for free from the kiddies menu. For Rivendell Estate & Vineyards, there’s the shimmer of gold, the promise of royal experience. Settle in for a long lunch and wall-to-ceiling views of the vineyards and mountains, to enjoy its special wine and canapé tasting plate in the spirit of spring. The essence of the season is reflected in green – the colour for Paardenkloof Ecology Lifestyle Farm. 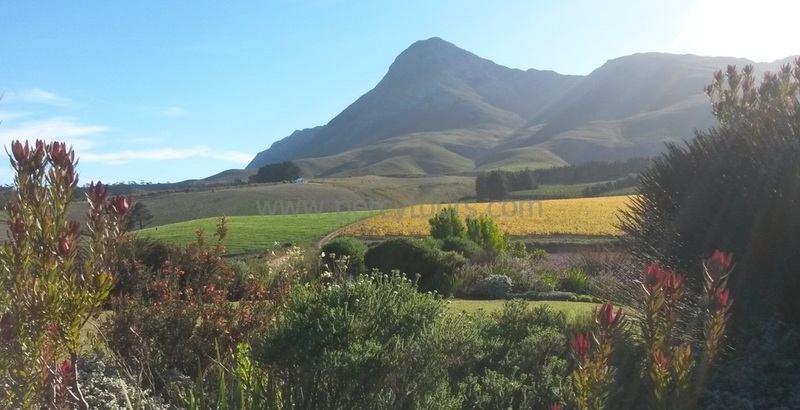 Enjoy wine tasting and a festival of fynbos in its Garden Restaurant and farm market. Attend a talk on landscaping with fynbos, each day at 09:00; and, order a picnic basket for lunch. Bring the children and their gumboots to explore the veggie patch, cuddle in the petting zoo or simply navigate the jungle gym. Then, wrap up each day from 17:00 on Friday, Saturday and Sunday with an evening of live jazz, pizza and sundowners: tickets are R180pp and must be booked by contacting daphne@paardenkloof.co.za or 079 504 3593. Sundowners will also be served up at Maremmana Polo Estate, where you can relax with a drink and a boerewors roll as all the rainbow colours recede from the sky. The rainbow bar opens on Saturday evening from 17:00 to 19:30. Tickets for the 2017 Bot River Over the Rainbow Spring Weekend cost R100 per person and can be purchased, along with tickets to individual events, at www.quicket.co.za unless specified otherwise. 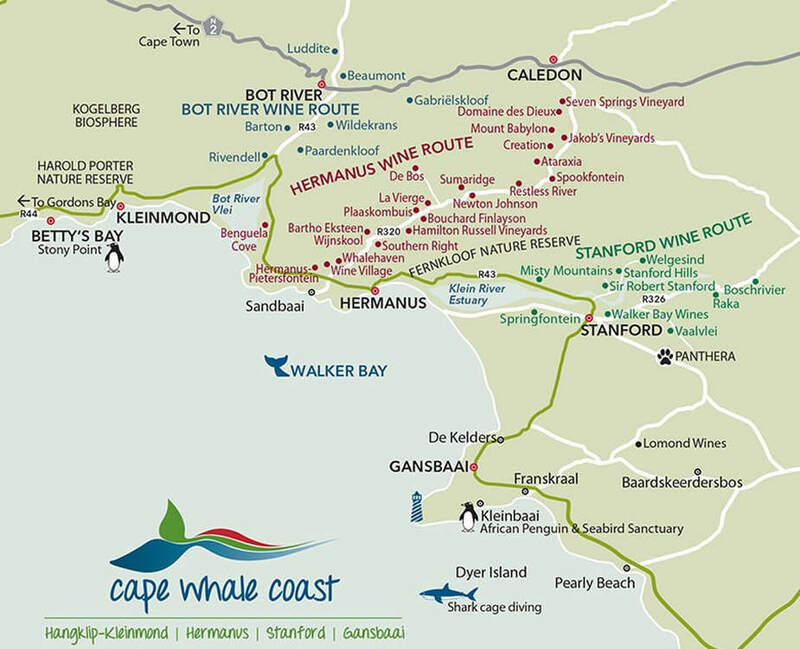 The weekend pass includes an armband and wine glass, which you may collect at the Bot River tourism office. Quicket stations will also be at Beaumont, Gabriëlskloof, and Wildekrans on the weekend. Youngsters under 18 years may enter for free. 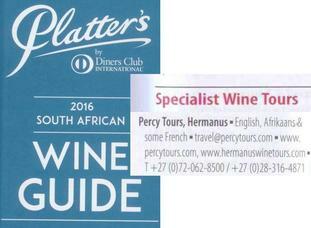 For the 8th year in a row, we are honoured that the influential John Platter Wine book of South Africa, has listed us, as ONLY 1 of 2 local Wine Tour Guides in Hermanus that John Platter recommends; check us out on page 657 of the new 2019 book.